As our last Pen Newsletter was so popular, we thought we'd offer even better deals this time around! Promotional Pens are being practically given away at these crazy low prices and the best bit is, the prices are staying down! Printed Plastic and Metal Pens provide excellent brand exposure for your corporate logo, web address and business name and are suitable for just about any event! The best part of investing in some promotional pens is that you can buy in bulk, save big bucks and distribute the stock over time allowing your brand to constantly circulate. Match your corporate colours to a Printed Promotional Pen, but be sure to get in quick as stock is running out the door! 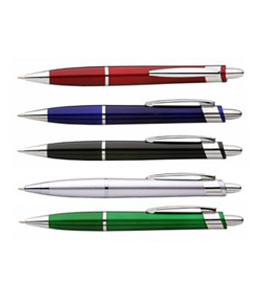 Yale Pen: Check out this corporate designed Plastic Yale Pen and give your brand a premium look. 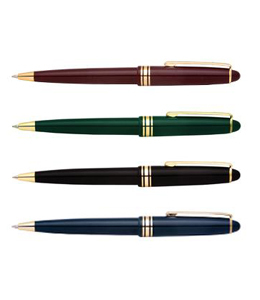 This low cost classic style click action Pen is available in 4 executive colours with gold detailing. Full of style and offering a print on the barrel, this Pen is ideal for all occasions! Coloured Flamingo Pen: This stylish click action Plastic Pen is sure to add some colour to your brand! Presented with an integrated grip and clip holder, the Flamingo Pen is available in 6 great colours. Keep well within your budget and opt for this funky coloured Flamingo Pen with printing. 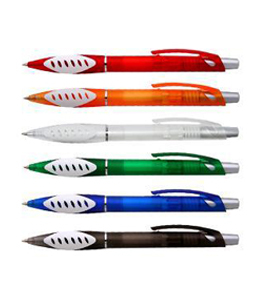 Printed Pioneer Pen: Choose a fantastic looking pen to match your brand- the Plastic Pioneer Pen! This metallic painted pen with chrome fittings has a very modern feel, providing your clients with a sleek look and great value for money. This Pen is ideal for trade shows and corporate functions. Dynagrip Pen: For a pen that is a little less out there yet still offers great brand exposure, try our Dynagrip Plastic Pen with printing. The Dynagrip pen is presented with a solid white barrel and coloured grip, clip and push button to add a little extra flair. 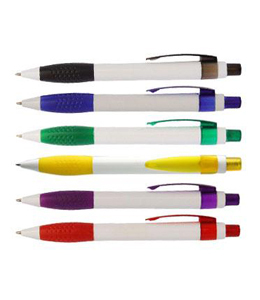 At Vivid Promotions we love to offer great deals on Printed Promotional Pens! As pens are used on a daily basis, they are a fantastic merchandise item to promote your corporate logo at such a small cost! Printed Plastic Pens are one of the most popular products on the market, just look around- how many pens with logos, web address and phone numbers do you have on your desk? Each person owns an average of 3 Printed Promotional Pens and that's just in the office. You can keep it as simple and elegant as you like or you can go all out and choose a multi coloured novelty pen, it's up to you! With over 1200 Pens available from Metal Pens, Plastic Pens, Eco Pens, Novelty Pens and Luxury Pens; we really do have the lot! With many branding options to choose from such as a 1 or 2 colour print, full colour print or laser engraved logo, your branding is sure to stand out in a crowd. Furrealz? That\'s marevluosly good to know.